Sis and I, we were walking around at Fairprice and saw this new drink being promoted. 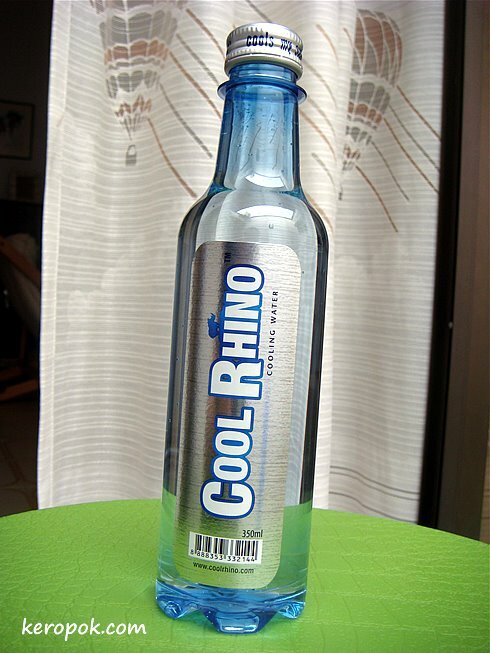 Cool Rhino Cooling Water. It sure caught our eye and we thought why not try it? Sis has been feeling heaty because of the weather and was having a sore throat. We saw that it should be drunk 4 times daily. Oh well, we got 2 bottles of it since it was on promotion. But that's only 2 times, we need more. We decided it was just to try it out so we did not bother to take more. As we walked along the aisle, we saw ey, this is also something similar, and it's like much much cheaper. We remembered our older cousin who says this drink is good when one is feeling heaty, so we thought maybe this 'old people' drink might work. The next morning when we woke up, we took a close look. Hey! Both are manufactured by the same company! Same ingredients too! We concluded that the old design was for the old timers who are used to it, maybe a name like Three Legs appeal to them. The new design is to catch youngsters attention! Cool Rhino sounds cool right? We laughed our heads off! If you are wondering how it taste? Both taste the same. It taste like plain water except that you get a cooling sensation on your mouth. The shorter and older design is meant for my generation lah! The Three Legs brand, also known as Kaki Tiga, originated from Indonesia. It's is an old brand with pretty good reputation. Hahahaha do not judge a book by its cover! 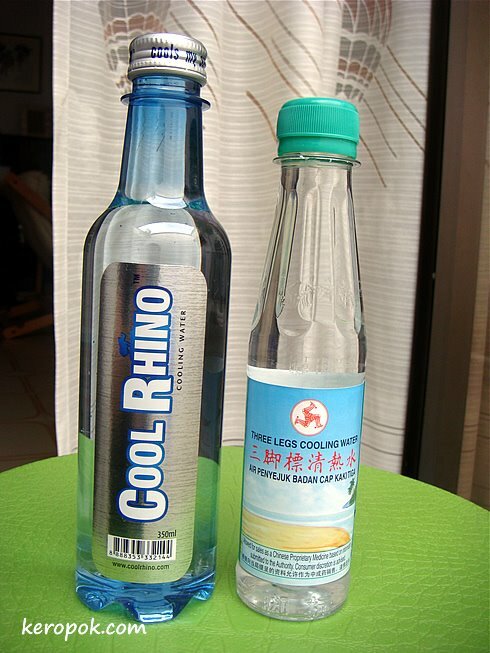 I saw the billboard for CoolRhino in Msia, I thought it was some alcoholic beverage!!!! 3 Legs brand is 100% Singapore products, since 1937. Wow, a total departure from the old brand. Interesting marketing exercise. The website calls it a body coolant, with Gypsum Fibrosum and Calcitum. 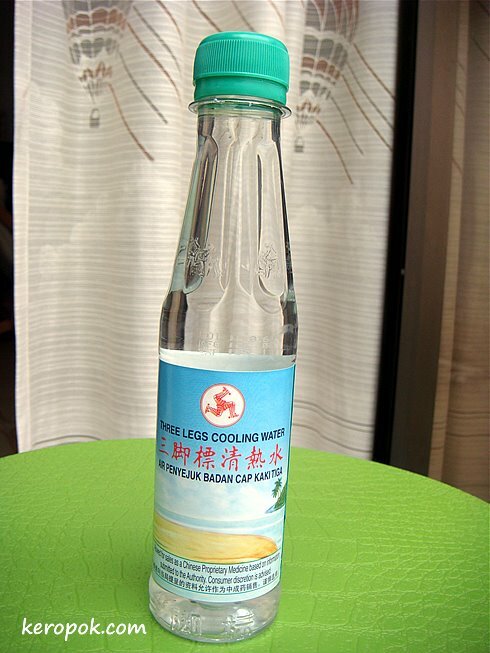 The Kaki Tiga reminds me of the Laoshan Oldenlandia Water, which I haven't seen for a long time. It's a re-branding and packaging exercise to "freshen" up the product. Gypsum is a plaster stone of sulfate of plaster stone group, containing mainly hydrated calcium sulfate. If you google calticum you come up with something in vietnamese! err not sure I want to be drinking slurry water ... even if it is in mi uute quantities! Good that we have bloggers ready to brave the unknown to taste test! looks like those who don't like to "Sar Kar" can now go for cool rhino!